1. Jaromir Jagr– legend in his own time for both his skill on the ice and off. Jagr was formerly the captain of the New York Rangers and took the city by storm with his skill, hair and partying. 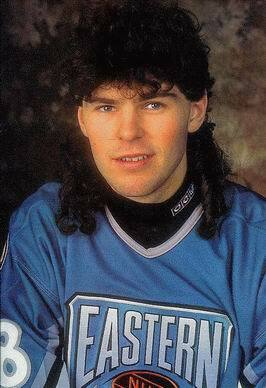 The classic hockey hair is the mullet of Jagr. 2. Henrik Lundqvist– called King Henry by his followers and fans who hate him, he is the best of the best in his craft of goaltending. Watch him make ridiculously spectacular saves in the face of sticks and pucks flying at his pretty face. He won’t flinch or cry at all. 3. Claude Giroux– one of the most talented skaters on the ice. The Flyers have a piece of hockey gold with this one and expect some skilled offensive play with his 46 points on the year. 4. GAS LINE- Marian Gaborik, Artem Anisimov and Derek Stepan have made this line for the Rangers the buzz on the streets of Broadway and beyond. Watch and enjoy the cohesion and concept of offensive maneuvers these guys create. 5. Peter Laviolette– coach of the Flyers will look calm and cool compared to the other man on the Rangers bench. But don’t be fooled. Laviolette shoved Dallas Stars Steve Ott recently. He has turned the Flyers into a powerhouse of impressive players. It’s fascinating to watch the interaction on the bench and see how it transcribes on ice. 6. John Tortorella– on the other bench is Torts, the Rangers coach who will be shouting or hanging his head at some dumb move from the Blueshirts. His crew is young, talented, but not always the smartest. He’s entertaining for sure. 7. Carl Hagelin- this Michigan rookie is shocking the hockey community with his speed and go-to presence on the ice. New York fans are tough to win over, but he’s charmed them by the style of his play and his fabulous hair. 8. Brad Richards– has taken over as gossip column king dating Olivia Munn. His start with the Rangers was slow, but now he’s jump-started to produce almost every game. 9. The outdoor game– outdoor hockey games are the purest form of hockey. Can’t get better than that. 10. The rivalry- Only 90 miles apart, the Flyers and Rangers are fierce rivals. Bitter and promised to be a battle beyond last years Caps/Pens game. Living in southern New Jersey, there is a split between Philly fans and New York fans. The Winter Classic 2012 represents Atlantic hockey in the eastern US and plenty of viewers will recall fond times when these two have met before. Families may be divided, friends may jeer against each other, but it’s all in good hockey fun. Happy New Year!! Four points have Sidney Crosby back in the game. His debut on Long Island stunned everyone leaving the Islanders blank. Was he that good or were the Islanders in awe of his return? Crosby’s return to the NHL was covered in the media as the celeb he is, humbled, but the pump was no fake. Sid the Kid delivered. Meanwhile, in Washington the Caps are having Alex problems. When Alex Semin is a healthy scratch and Ovie lacks, where is the love in D.C? Good time to trade Semin in you fantasy league. Cup predictions for the Caps are in need of some serious tweaking. The Rangers agitator Avery is back and the Blueshirts are tallying wins like the talented team they really are. If you are following the Brad Richards-Olivia Munn hoopla, then go read Puck Daddy who felt it was newsworthy. If you are a Rangers fan then the Avery bug bit you the most, not the love bug. Now that the Eastern Conference has their guy back, let’s give some applause to the rest of the Penguins who have maintained the top sport despite playing without their top dog. Pittsburgh is rocking knowing that the Cup could be coming to their town if things hold up. Finally, Rangers fans have their razzmatazz back on Broadway, or do they? News out of training camp created an impeccable look into the metamorphosis of the New York Rangers. Despite a loss to the New Jersey Devils in preseason, the Rangers have an incredible group of players who will overcome any obstacle, particularly if coach Torts has anything to say about it. So why are they sitting last in the division? Considered by The Hockey News for the Jack Adams award for best coach, John Tortorella won with the Tampa Bay Lightning in 2004, and he will win again. With the cast of talent in New York, the playoff run will surpass the past few season. Filling in the gaps will bring the Rangers the stature the team, Torts and the fans expect from an Original Six team. Fan-fave Sean Avery was given the boot and possibly took the energy with him. While Torts and Avery clashed, the talent on the team now did surpass Avery’s abilities over the long haul. The New York Rangers paid a pretty penny to secure dominance in the New York market with the addition of Brad Richards. Richards is excited to be playing in New York, but has he been distracted by the huge crowds eyeing his every move? Are the Rangers able to deliver on their preseason prowess or will they find Richards a bust in the Big Apple? Too soon to tell Rangers fans. Let Ryan Callahan lend his captaincy to the cause. The Rangers looked good and they have the tools to do it, eventually. How about those Buffalo Sabres? Great team concept with Derek Roy, Jason Pominville, Christian Ehrhoff, Tyler Myers, Robyn Regehr and the entire cast of the Sabres who could become the New York team fans are cheering about on Broadway. Ryan Miller’s blueliners are showing more cohesion and so it was planned to stop that gap effectively showcasing Miller’s abilities. Be true Buffalo fans and allow those bandwagon fans to cheer because when was the last time that happened? Tavares has brought the New York Islanders the franchise player the Island wanted. Not quite the fisherman of yore, but steering the boat nicely. The return of Evgeni Nabokov looks like a nice fit by the confidence in goal against the Rangers over the weekend. With Ricky D out again, anything can happen in net. The New Jersey Devils are close behind with their confidence in their new coach and new system in play. The nagging issue remains in net with Martin Brodeur an iffy healthy mainstay. Johan Hedberg is no slouch. Hedberg served with the Penguins and is familiar with the demands in this division. Look for the Devils to add players as needed- recent rumor for Kyle Turris. The Philadelphia Flyers and the Pittsburgh Penguins make this division an enticing race. With Jagr’s return and Sidney Crosby slated to return soon, the Pennsylvania teams will lace up and tighten the race for New York’s teams. To the chagrin or cheers of hockey fans everywhere, the mulleted wonder that is Jaromir Jagr has returned to the NHL. After snubbing a deal offered by his original team, the Pittsburgh Penguins, Jagr signing a deal at the other end of Pennsylvania resulted in a sweet deal for the Philadelphia Flyers and Jagr. The Flyers’ deal is worth $3.3 million. The 39-year-old Jagr spent the past three seasons playing in Russia, but had kept the hockey world abuzz with rumors of signing with various NHL teams including the Detroit Red Wings and the New York Rangers. Jagr’s decision to play with the Flyers was a result of the savvy intentions to create a Stanley Cup contending team. Adding Ilya Bryzgalov in net boosts the Flyers ability to maintain a quality netminder and not succumb to the turnstile of past years. Perhaps this is the team where Kris Versteeg will land for longer than a stint. The Jeff Carter trade to Columbus brings Jakuc Voracek, while the Mike Richards trade brings two great players in Wayne Simmonds and top prospect Brayden Schenn. Former Dallas forward, Brad Richards, will don a New York Rangers jersey as Chris Drury exits. The Rangers will be contenders this year and get past the first-round of the playoffs. The Eastern Conference will be compelling with Jagr, Richards and hopefully Sidney Crosby in the mix. Now the question is whether Patrick Kane’s mullet wearing for the 2010 Stanley Cup playoffs will make a return, if Jagr can get the Flyers back in the playoff fun. Let the players rock the business-up-front, party-in-the-back look. Let’s hope the beard gets a rest.